What is Jiaido Kid’s Program? JIAIDO kids program is a unique education system, which is targeting especially the development of consciousness. 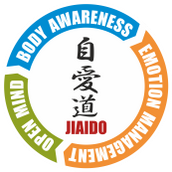 ”The goal of Jiaido Kid program is to help children to improve their physical and mental and emotional abilities and to hold them in the state which is their own true nature." Jiaido for kids is not only a new way of practicing martial arts and playing sports, but a new approach towards life. It is an all-inclusive system which not only builds up their self-esteem, but also helps children to gain compassion, honesty and wisdom. It will provide them with the knowledge and tools they need to manifest their inner values in their actions. This will lead kids into a new level of consciousness, eliminating mental suffering and lack of contentment. Regular program takes place at the Dojo in the city once or twice a week. All Jiaido practices are designed to assess and develop children's physical, mental and emotional ability through unique and attractive games which make children participate in an active and joyful way. As part of the global ‘green’ movement to improve the environment, gardening is gaining popularity as an activity for people of all ages and physical abilities. Gardening is an excellent way for children to get moderate-to-high intensity physical activity and promote healthier lifestyle. What people, parents and educators don't realize is that the right activity matched to the 'learning readiness' (or the correct stage of learning readiness) is a joy, and captivates the child's attention wholeheartedly. The secret of successful learning – which is in focus in Jiaido for kids program – is to harmonize the workshops with the kid’s skills and actual willingness to learn. We create programs which engage them, where they can learn in a playful and joyful way, with having their heart in the exercises. Gardening has a strong effect on children's mentality and attitude: it helps them to learn valuable lessons about patience as they wait for vegetables to grow, responsibility as they see how necessary their care is to the garden and they also get a better understanding of where food comes from. Developing More Empathy: Children see animals as peers. They can identify themselves better with animals than human beings. Animal psychology is very simple: with animals, 'what you see is what you get'. Humans are not as direct. We need to develop talent to read and interpret “body language”. Children can read an animal's body language. As children get older, their ability to empathize with animals will carry over into their experiences with people. Developing An Outward Focus: Individuals who have mental illness or low self-esteem focus on themselves. Animals can help them focus on their environment. Rather than thinking and talking about themselves and their problems, they watch and talk to and about the animals. Animals have a way of accepting without qualification. They don't care how a person looks like or what they say. (Have you ever heard of your dog deciding to go to your neighbors because he or she feels it is better out there?) An animal's acceptance is nonjudgmental, forgiving, and uncomplicated by the psychological games people often play. They accept you the way you are. Mental Stimulation: Mental stimulation occurs because of increased communication with other people, recalled memories, and the entertainment provided by the animals. In situations that are depressing or institutional, the presence of the animals serves to brighten the atmosphere, increasing amusement, laughter, and play. These positive distractions may help to decrease people's feelings of isolation or separation. It is well established that touch is very important for the nourishment of our mind and spirit. Infants who are not touched do not develop healthy relationships with other people and often fail to thrive and grow physically. For some people, touch from another person is not acceptable, but the warm, furry touch of a dog or cat is. In hospitals, where most touch is painful or invasive, the touch of an animal is safe, non-threatening, and pleasant. To hold, hug, and touch can make a world of difference to people who would otherwise have no positive, appropriate physical contact. Many people are able to relax when animals are present. Tests have shown that the decrease in heart rate and blood pressure can be dramatic. Even watching fish swim in an aquarium can be very calming. Some people feel spiritual fulfillment or a sense of oneness with life and nature when they are with their pets. This is hard to define or explain. Some well-known authors have described their relation with animals and nature as part of their sustaining life energy and/or part of their communion and relationship with God or life. Most of kids today are suffering both physically and emotionally because they don’t spend enough time outside in and withnature. Too often our days are spent indoors at work and taking the kids from place to place, that we forget the true value of spending time in nature, even though ithas several benefits, especially for kids and their physical and mental health. Modern life puts lots of pressure, - usually invisibly - on our children, especially on sensitive children. Children’s brain is immature and unable to cope with the stress of modern adult living and they often misinterpret adult’s challenges as being about them or their fault. Consistent stress becomes distress and the brain is seriously affected. Irrational behavior, unstable emotions, sleeplessness and defiance are potential signs of that a child is in stress and struggle. • Balance is the ability to maintain controlled body position during task performance, whether it is sitting by the table, walking the balance beam or stepping up on a kerb. To function effectively across environments and tasks, we need the ability to maintain controlled positions during both static (still) and dynamic (moving) activities. Static balance is the ability to hold a stationary position with control (e.g. “Freeze” or “statue” games). Dynamic balance is the ability to remain balanced while engaged in movement (e.g. running or bike riding). Coordination is the process where the body’s neurons and limbs work together to produce movement. This is a highly complicated process that most people do effortlessly. For most people, the act of tying a shoelace or standing up is done with no conscious thought at all. While coordination is used to describe the highly complex way that humans move, most people mean something different when they talk about it. The term is traditionally used to describe balance and reaction time. It also refers to a person’s ability to remain on his or her feet or move with little effort. Creativity and Art activities can help children make sense of their cognitive, physical, emotional, spiritual, linguistic, and moral development by enhancing the whole curriculum. By bring this opportunity children’s learning, providing a positive focus for shared experience and communicationcan impact positively on confidence, self-esteem, personal, social, emotional development and behavioral health. This can happen through reading, singing, roleplaying, making music or sharing memories in photographs, for instance. This leads to sustainable progression, raising standards of achievement and a sense of fulfillment and understanding of who they are and how valued they are as individuals in the world. Paying attention is a mental function, and therefore it does not need to be taught. However, paying attention as such is a function that is quite useless in the process of learning, because it is only a fleeting occurrence. Attention usually shifts very quickly from one object to the next. The child needs to be taught first to direct his attention on something and to keep his attention focused on this particular thing for some length of time. When a person focuses his attention for some length of time, we refer to it as concentration. Paying attention therefore, is a mental function that makes the skill of concentration possible, just as the functions of seeing and hearing make the skills of looking and listening possible. Effective communication is one of the most critical skills kids need to succeed both socially and academically. Good communication ability plays a fundamental role in making and keeping friends. A child or adult with well-developed social and communication skills incorporates the needs of conversational partner(s), situational and emotional factors, appropriate language rules, and social mores, and can shift the level of language necessary based on the demands of the moment. These are complex skills that most children learn by the time they are of school age. Communication is also critical to success in school. Both spoken (oral) language and listening (aural) language are the foundations of literacy, and difficulty in either contributes to difficulties with printed language. To discipline children is one of the most important yet difficult responsibilities of parenting, and there are no shortcuts. Teaching about limits and acceptable behavior takes time and a great deal of energy. The hurried pace of today’s society can be an obstacle for effective discipline development. The goal of effective discipline is to foster acceptable and appropriate behavior in the child and to raise emotionally mature adults. A disciplined person is able to postpone pleasure, is considerate of the needs of others, is assertive without being aggressive or hostile, and can tolerate discomfort when necessary. The foundation of effective discipline is respect. The child should be able to respect the parent’s authority and also the rights of others. Inconsistency in applying discipline will not help a child respect his or her parents. Harsh discipline such as humiliation (verbal abuse, shouting, name-calling) will also make it hard for the child to respect and trust the parent. Thus, effective discipline means discipline applied with mutual respect in a firm, fair, reasonable and consistent way. The goal is to protect the child from danger, help the child learn self-discipline, and develop a healthy conscience and an internal sense of responsibility and control. Esp - Extrasensory perception is a term used to describe a means of getting information from other than the five senses that everyone uses as their primary means. The five senses are seeing, feeling, smelling, tasting, and hearing. These are considered to be our 'normal' senses and any other sense or way of gathering information, is said to be 'extra', or out of the ordinary.